I edited a book on Chicago's Empty Bottle. The book comes out in a few weeks. Editing, in this case, was largely concerned with gathering material--essays, interviews, photos, poster images. Preview coverage for the book is in the links below. Get it while it's hot: Order The Empty Bottle Chicago: 21+ Years of Music / Friendly / Dancing from Amazon. Here's an unpublished interview I did re: the book. The project itself as well as that working title were in place before I came on board. I never felt invested in that subtitle and as the project took shape, I realized it didn't have much to do with how I think about the Empty Bottle and played a bit too much into the stereotype of a "dive bar." Some of the touring musicians I spoke with for the book also took exception to that subtitle, noting that the bathroom really wasn't or isn't that bad compared to that of other places they play--even in Chicago. When you're touring, they noted, a locking door and toilet paper can make a huge difference. The language from the awning Music Friendly Dancing always seemed to echo around my head. It felt more natural. It wasn't a big deal to change it. You've played at the Bottle with which of your bands (all of 'em? ), and during which eras? I played in a punk band in high school and in a few DC bands that were short-lived and didn't tour, but otherwise I think any band I've played in for an extended period has played the Empty Bottle at least once. In the nineties, I played with Chisel, a band we founded while studying at Notre Dame and eventually relocated to Washington, D.C. We played Chicago often, however, and recorded in Wicker Park. In surveying the club's old listings for the book, I was surprised how many times Chisel had played the Empty Bottle, how early on and with which bands. Some of the musicians that pop up in the book--Ken Vandermark, Brian Case, Jay Ryan were on those bills. In general, Chisel did our own booking and the Day-Runner was always kept updated with the number of whomever was booking the Empty Bottle at the time. While we played the Czar Bar, Fireside, Thurston's, Metro--we tended to play the Bottle. I think because they knew us and had been there from early on. In the mid and late 2000s, I was with Perfect Panther (with former Reader scribe Miles Raymer), The Tax (a garage band from Athens, OH that had reconvened in Chicago) and Chicago Stone Lightning Band, all bands that played the Empty Bottle regularly. And a few years ago, I played drums with Zed or Zjed for a few Empty Bottle shows. Then booker Pete Toalson was always receptive to the bands I was working with--as well as forgiving. I've certainly had a few off nights there. Drum crimes and rhythm fouls. How long did it take you to compile all the stories? When did you start hitting people up? And how many interviews did you do for the book? The project started taking shape in late 2013--it was announced on Chicagoist around that time, I believe. I started reaching out and doing interviews in March 2014 and calls for submissions went out from the club and publisher. Material gathering didn't ramp up until a bit later--and took place sporadically. Between interviews, submissions, essays, there are approximately 116+ voices in the book. What was the most surprising detail or indelible memory about the Empty Bottle you came out of this book project with? I love detail, but this project, perhaps because of its sprawling nature, became about seeing things more broadly, almost taking an outsider's perspective to try and see what's special about this place, if anything. For a lot of folks, the Empty Bottle has been their living room. It's a place they grew up in, so they take it for granted in some ways. It's so obviously not perfect, but somehow it (usually) works. The consensus from our contributors was really that the booking--the "curation" if you will--has always been tremendous, that's the calling card. It was exciting when someone could recall an unusual show like it had just happened the night before and I could picture it in my mind's eye. The Flaming Lips playing an encore on the beat-up piano, the Yeah Yeah Yeahs playing an opening set, Jay Reatard grabbing the disco ball, someone legendary like John Fahey, Terry Reid or Jandek playing there and someone interacting with them. It's all very personal, which I love. I came away thinking a lot about memory and moments. If life is made up of moments, what makes us acquire some moments and not others? Why did we hold on to one from the Bottle? Some of the most indelible nights of our lives are spent in these places (The Black Cat, the Empty Bottle, etc. ), so is there anything to it beyond cheap drinks and really loud music? We love music. What else is there? Community? It's odd to think that this is where we go searching for the sublime, but a lot of us do. What was surprising in a way was just the overwhelming humanity of the place, the social network that revolves around it, the music culture that's built up in this part of town over the decades. I was also struck by how Chicago continues to reckon with the nineties--so much was set in motion in that era and we're still living with it in some ways. And how this music--what was once considered underground--is so closely connected to this city or how people see their lives here, why they're here. Hopefully, some of this comes across in the book. 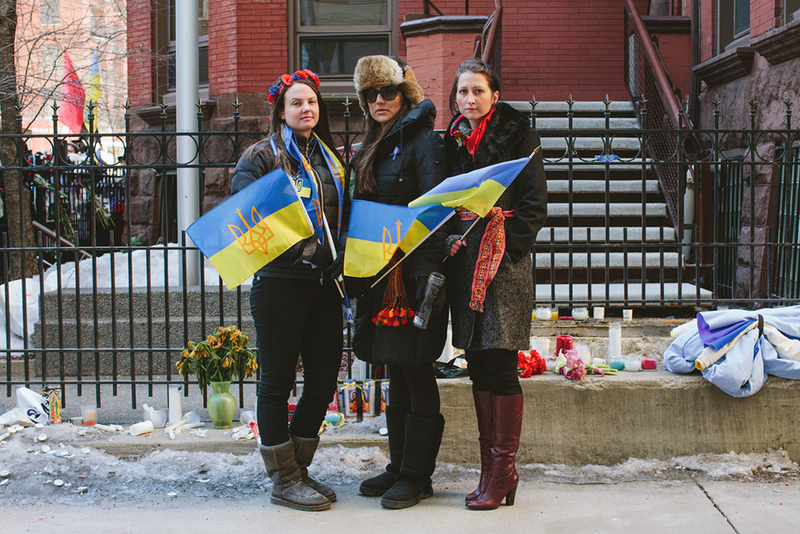 I interviewed Chicago area Ukrainians about the recent uprising and future of their country for the newly launched Vice News.